Vivaty 3D virtual world shuts down – Nina Gerwin's Blog, explained for my friends, the worlds of virtual worlds, TV entertainment, mobile, social and internet marketing, and their convergence therein. Shuts down on April 16. A few days ago, it was announced that Vivaty was shuttering it’s doors and was able to find a buyer. Hopefully, the assets will be used for something great. There have been a surprising number of closures or fire sales since the end of last year starting with metaplace going dark, the closure of There.com, the release of Project Wonderland and Darkstar by Cisco after their acquisition of Sun, and now the fire sale of Vivaty and Forterra’s enterprise OLIVE and MeetingLabs platforms to SAIC. IMHO, timing is everything. Metaplace and There have been around long enough to sit in the shadows of Second Life but weren’t able to provide broad enough creation tools and upload abilities to create robust economies and environments. They didn’t have to exceed or meet all of SL’s features but just needed to be able to keep up with the maturing needs of their users. Vivaty on the other hand launched a social-based world quickly but couldn’t find it’s footing and unique features quickly enough to attract and sustain an active user base. Although Vivaty had social features, they didn’t match IMVU’s social depth and lost on that front and defaulted to the decorate and share aspects instead. Decorate and share is okay for kids but just not compelling enough for adults. 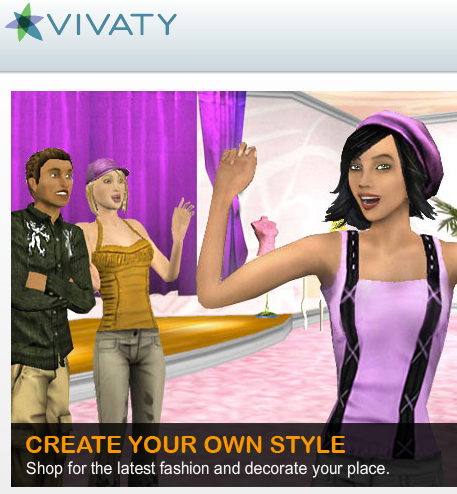 When I last checked them out, Vivaty provided avatar fashions but you couldn’t create and share/monitize your own. I truly believe that at this stage of virtual worlds, if you’re not a purely social play, creation is the underlying motivation that keep users coming back – to either create your own stuff or to check out what other people have done since the last time you visited. Vivaty missed that boat. The sale of Forterra’s OLIVE platform was a surprise and it appears it will continue with SAIC. But it’s the closure of their MeetingLab web portal that saddens me as it’s unclear whether SAIC will support ML. If SAIC is smart, they will because there is a huge market for this type of product – enterprise level robust meeting and event virtual worlds that avoid overburdened corporate IT departments with behind-the-firewall installations. The large programs are too big and too expensive. It’s been a tough time for 3D immersive virtual worlds lately. Hopefully with the huge push by the CE manufactures + consumer entertainment companies into the 3D entertainment world, there will be a resurgence in interest in the 3D immersive world. I’m keeping my fingers crossed. Which virtual worlds do you love and why? There.com because it ran so smoothly and didnt require a high performance computer to play on. vivity always had something to make it fun and didnt lag as often, you could customize it way may also, i really hope it comes back on…my sister, cousin, and best friend also agree.